The ultimate Segway tours! Safari Tours, History Sydney Armory Tours and Classic Parklands tours! We have it all. Experience lots of varying terrain! What makes Segway Ultimate Adventure Tour (90) so popular? You see 30 minutes or 60 minutes is simply just not enough time to ride one of these amazing machines! So we’ve created the ultimate Segway Adventure experience. 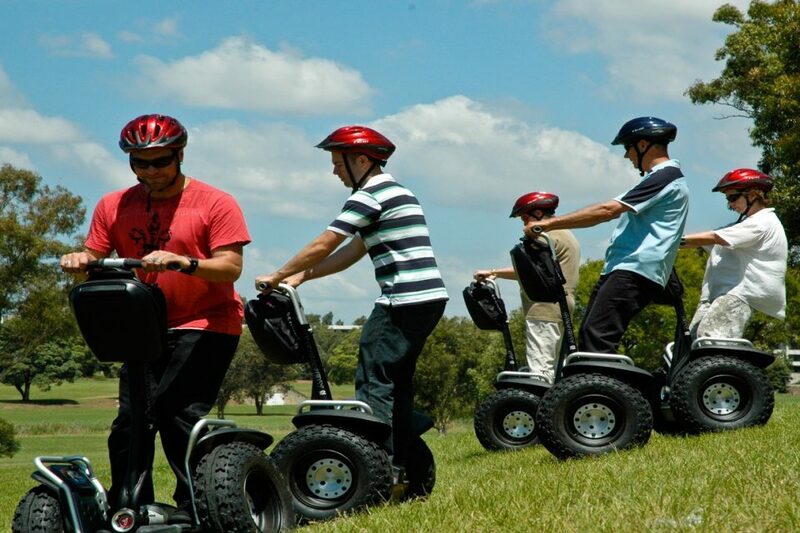 On these 90 minute Segway adventure experiences, you will zoom up, down and over a variety of different terrains and get the opportunity to put your Segway through its paces and becoming an advanced Segway Rider. If you’re in Sydney, head on down to the Newington Armory at Sydney Olympic Park where you’ll cruise up, down and around on paths, gravel/rocky roads, grassed areas, around old bunkers and heritage listed buildings and travel across a variety of different terrain. You’ll even learn a little bit about this heritage site. 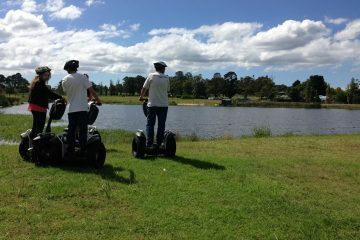 If you’re on the Gold Coast, then you must do the Segway Safari 90 Minute Adventure experience. You’ll zoom through one of last remaining sand dunal eco-systems remaining on teh Gold Coast and get some amazing photo opportunities of the Gold Coast skyline, spot wildlife, see the beach, travel through pockets of rainforest and more! If you’re on the Central Coast of NSW, then head to the Mt Penang Parklands where you’ll glide around the parklands and bush and enjoy putting your Segway through a variety of different terrain. You see it takes only moments to learn to ride a Segway but forever to get the smile off your face! Riding one of these all-terrain machines is quite simply amazing; it feels like nothing you’ve experienced – because there’s never been anything like it. This is fun, excitement and adventure wrapped up in one fantastic experience! So if you are looking for an experience with a difference, then don’t delay, book today and have an adventure you’ll truly remember! Please check the specific tour you are interested in to under the age and weight restrictions. Q: CAN THOSE UNDER 18 COME ON A TOUR ALONE? Typically tours operate in groups of 7-8 guests or less per facilitator. Q: WHAT IF I HAVE MORE THAN 7 PEOPLE? Unless otherwise arranged prior (for larger groups), the group will be split up for safety reasons. Q: DO YOU PROVIDE PRIVATE TOURS? We most certainly can arrange a private tour for your group. Pricing may vary depending on the number of people due to the fact that the tour is exclusive for your group only. Q: WHAT TIME DO I NEED TO GET THERE FOR MY TOUR? If you could arrive 10 minutes early for your scheduled tour to fill out the necessary paperwork. Each rider will need to sign a liability waiver form and if the rider is under 18, a parent or guardian will be required to sign on their behalf. Q: IS TRAINING INCLUDED AS PART OF THE TOUR? All tours include a period of time for training and learning how to master riding these amazing machines. On average we allow about 10 minutes of hands-on rider training as part of your tour. The tour will not commence until you are 'rider ready' and the facilitator is confident you can safely ride through the various terrain you will encounter on the tour. Q: WHAT HAPPENS IF I HAVE AN ACCIDENT WHILST ON THE TOUR? You are responsible for the Segway whilst it is in your possession. Therefore if you damage someone’s property or injure yourself or someone else, you are responsible for any damages, this includes our Segways. In there is damage to our Segways, you will be required to provide a $750 security deposit by way of credit card. This money will be retained until such time as we can get a quote for the damages. Once we know the full costs, you will be required to pay these within 7 days. Q: IS THIS TOUR OFFERED IN ANY OTHER LANGUAGE BESIDE ENGLISH? All tours are in English. We can, however, organise private rides in other languages if required. Q: HOW DIFFICULT IS IT TO RIDE, WILL I BE ABLE TO PICK IT UP QUICKLY? Riding a Segway is pretty easy and you will generally master all the various techniques for riding in various terrains in about 10 or so minutes. The tours are generally classified as medium. It is designed so that you first learn the technique of riding one of these amazing machines and then once the facilitator deems you 'ride ready' you will spend the remainder of your time cruising and zooming around seeing various vistas which vary depending on the tour you are on. Q: CAN MORE THAN 1 PERSON RIDE THE SEGWAY AT ONCE? Q: WHAT IF I AM PREGNANT, CAN I STILL RIDE? Unfortunately not. We feel the risk to both child and mother to be too high to allow pregnant women to participate in any Segway tour or ride. Q: ARE THE TOURS CANCELLED IF IT RAINS? Generally tours will proceed in light rain, we have some rain jackets available for you to use, but please check availability, otherwise feel free to bring your own. If we decide the rain is too heavy, for safety reasons we may elect to reschedule your tour to another day, if this day is unsuitable for you, we will provide a full refund. Q: WHO IS RESPONSIBLE FOR PROVIDING MY TOUR? Segway Ultimate Adventure Tour (90): Now playing at a venue near you! Time Out Adventures & Entertainment is a sales, marketing and booking agent for Segway Operators that provide rides and tours to the public. Time Out Adventures is not the operator of these Segway Experiences. If you require changes to your booking, please contact us and we will facilitate this change for you. Fees may apply. The Segway Participant acknowledges and agrees that, upon accepting a Segway experience booking through Time Out Adventures and Entertainment, they Acknowledge that Segway Riding is a dangerous recreational activity within the meaning of the Civil Liability Act (Qld, NSW & Vic) and involves a significant risk of injury, harm or damage and the participant accepts this risk when accepting the booking.